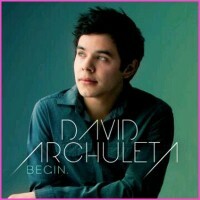 For many of us David Archuleta fans, Season 7 of A.I. was an eye-opener to both the beauty of David’s performances and the ugliness of some of the media slams against him. In fact, I cancelled a long-held subscription to Entertainment Weekly back then because they lost all credibility for me. Not only did they fail to appreciate how uniquely talented and original David is, but I was shocked at how mean-spirited and downright nasty they were toward him. 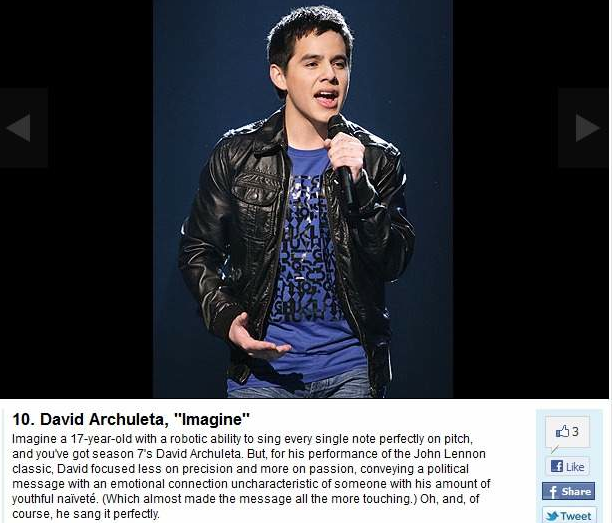 David doesn’t need autotune, so he’s “robotic”???? For me, that sentiment alone captures so much of what’s wrong with the music industry today. A place where real singing and musicianship have less value than repetitive hooks and shooting foam from your D-cups. And I fear that the proliferation of shows like Idol, The Voice, X-Factor etc. will only make things worse. They take an art form that should be about bringing people together, connecting heart to heart, soul to soul, and make it a cut-throat competition — both between the contestants themselves and their fans. Yes, these shows are there to make a profit, and the more fierce the “fight,” the higher each show’s ratings, the more readers for entertainment/gossip rags and more hits on websites that fuel fan wars. Guess I’m a hater too, ’cause I hate all this. I also hate how magazines, websites and radio stations manipulate and exploit the devotion we have for David, and other artists, and twist it for their own purposes. Hits down on your radio station or magazine’s website? No problem, run an Idol poll and you can show your advertisers a massive traffic bump. Idol and its offshoots twist music fandom into something more like sports fandom, where your team must crush all others. I love Mumford and Sons, but if they’d been contestants on Idol in Season 7 — or included on a Q102 poll — I’d have had to make a choice on who to support — that feels wrong to me. It seems David fans are torn between wanting to support our guy –and each other– and not getting sucked into the ugliness and fake rivalries perpetuated by these soulless sites. Of course, for David and the other contestants, the real battle is fought when they leave the show and enter the snake-pit that is today’s music industry — a place where real talents like Jordin Sparks end up wobbling on platforms to Glee-ish songs to please their label. But just when I start to get discouraged by the dark side of the entertainment industry, along comes David … no kidding … right after I’d scribbled out these ramblings, I saw this interview. He’s such a breath of fresh air I felt as though I’d been holding mine. I replayed a second time only to watch the interviewer’s expression as David talks about the power of music to heal and inspire. I’m pretty sure it mirrors all of ours. The best antidote to hate? Love, baby, love. P.S. So what do you guys think? 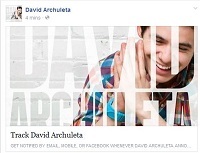 This entry was posted in Fan experience and tagged j'aime M. David Archuleta. Bookmark the permalink. I too watched this interview, David at his best, several times. As he became more passionate about his message, she was reduced to twisting her hair. Been there…. His sincerity and groundedness has a profound effect on anyone lucky enough to be sitting close to him and listening. He’s grown so much… and all in a good way. Haha, I love that….’she was reduced to twisting her hair’. I noticed that too. 🙂 He really has grown and continues to grow. We are really in for the ride of our lives and I can’t wait to see where he takes us. Then he sang and she was almost wordless. How do you know Jordin is pleasing only Jive and not herself? Her tweets are full of happiness and excitement about her new look and music. Thanks for this post right now, when I feel so suckered in and focused on all the wrong things!!! Manipulation continues and I am exhausted by it. David’s last interview is stellar!!! This is what it is all about…. music’s ability to heal and change and bring us together, no matter who we are fans of or what genre of music inspires us. So well said TOfan>>>>”I love Mumford and Sons, but if they’d been contestants on Idol in Season 7 — or included on a Q102 poll — I’d have had to make a choice on who to support — that feels wrong to me. It seems David fans are torn between wanting to support our guy –and each other– and not getting sucked into the ugliness and fake rivalries perpetuated by these soulless sites.” Why do we have to choose?? I am sighing in relief…..thank you TOfan, you are a word smythe!!! and I love you! Wow TOfan…how timely. Just when I got “sucked in” and came over here and (other sites) to post a link to another poll, where I felt there was not enough DA support. When sigh….I know better…it so doesn’t matter. I just feel this deep natural instinct to SUPPORT SUPPORT SUPPORT David. And not (really) cuz I’m some crazed person who loves playing manic fan games…but cuz I’m just so passionate about anything I find so worthy of supporting. And as I say…spreading the Davidlove, just seems so worthy. Great person. Great talent. Great music. Pure Heart. Good stuff. The “hating” and where it comes from, for anyone but especially for David, has always been an enigma to me…and I know it’s a waste of time and energy to even pay any mind to. Not everyone has to love what I love. I just think respectful expressions of what you love vs. dissing the “other guy” is the only way to go. I have to always remember…that stuff is always really about the people who feel the need to engage that way, and less about who they are dissing. Truly the best way to support David is to just keep “showing up” where it truly matters to him…however and wherever, for as long as he keeps inviting us to do so. I need to remember to forget the rest and keep following his wise (and gettin’ wiser every day) lead. I too just discovered that gem of an interview today (I’m a little behind in fansites these last few weeks too)…and loved it…also listened a few times. This continues to explain so much to us…as to where he’s at and why…and I support all of that too. “David the person” first, to me. Then all the rest as HE sees fit, and whatever we’re allowed to share in, is all good for me. Tks for the post and the reminder of what matters most. Well said TOfan. you are right on the money here. Couldn’t have said it better (or as well). Although I could ramble on and on with this subject but will try not too! Soulless sites indeed….after I spent a good deal of time last night voting for David in that silly radio poll and watched his percentages go down..down..down…I realized that David is already on the other side of down, always has been and always will be. No radio poll is going to change that and if the ‘glamberts’ want it that badly, they can have it. Doesn’t make one iota of difference when it comes to who David is and what he does. Honestly….robotic is a word that needs to be reserved for the dime a dozen young artists who are spit out of today’s music machine industry at a rapid rate to numb the brain cells of their listeners into thinking they are hearing ‘music’ at it’s best today. When in reality they are simply listening to another glitzed up, pumped up, autotuned, glazed over musician trying to make it in the business, on the strings of their label. David’s ASCAP interview is definitely a breath of fresh air. What a wonderful interview and how refreshing to actually listen to and enjoy this amazing young artist who is as genuine as they come. I admire David so much for sticking to all he knows to be real and of value and to want to make a positive difference in people’s lives with his music. He IS a voice that heals, no doubt there for me. The Ultimate Idol? There is also no doubt who that is. “He’s such a breath of fresh air I felt as though I’d been holding mine. ” Great stuff, AGAIN, tofan. I’ve never been a fan of these poll related sites and I’ve never seen the point in them. All it does is serve a purpose to gain more hits to their website. In fact, I’m willing to ‘bet my bottom dollar’ another poll will emerge as an offshoot from this one. I do not at all descredit the sincerity of the voters and their love and enthusiam for all things David related. But what will this achieve? Will the radio station play more of David’s songs? I doubt it. Well I had to put something LOL. I agree! I remember 2 yrs ago being so delighted that David won the Mr. Twitter Universe poll, lol. Little did I know that it would be followed by Mr. Twitter Planet, Mr. Twitter World, Mr. Twitter Idol, etc. And great post TOfan! I love how you present your case. Thanks so much TOfan for this article. It says exactly what I feel. This whole competition thing – my idol is better than your idol is dumb! This is not sports – it’s music. People like different artists and different styles of music. It’s all in the ear of the person. David is a fabulous singer and in my mind the best. He’s my favorite idol, but other people like Adam better or Cook or Clay, etc. At the end of the day all David and the rest want is a career in music. It’s perfectly okay for them all to succeed! Once again you are brilliant and as always I love your heart. GO DEB! Polls schmolls…I have voted on more than I care to think about in the past until I finally realized it means nothing, nada, zip, ze-roh in terms of David’s career. It did give me a sense of contributing, however, and served a purpose for a while. I have to admit when I see David win a cyber poll, I do feel a sense of V.I.C.T.O.R.Y. on one hand (*sigh*) while realizing on the other that polls don’t mean a thing without single, album or tour ticket sales as far as career sustainability. I got involved in this cyber fan world looking for like minded. 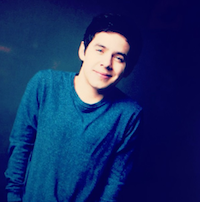 I find if I stay the course with like minded and spend little to no time with the “hate” element, I get to enjoy all the good of being a David Archuleta fan. I’ve always pondered the extremes that David has generated in fans, entertainment critics and media commentary. And the “robotic” comment did give me pause until I remembered EW is pretty much a sensationalist oriented celebrity gossip rag. David’s talent captures one’s immediate attention which is the good and then the rest, the reaction, be it uber fandom or uber hate or somewhere in between, is totally up to the listener. AI is a double edge sword and I’ve accepted that for the rest of David’s career he will have recurring references to being an AI alum, be it high praise or ignoble slights, for his emergence into the entertainment world (and to my awareness)through AI. In the scheme of things, my hope is for David make his kind of music, a body of artistic work, whatever that ends of being. Whether he wins one more cyber poll or down the road a Grammy, matters not. Now that he has taken the reins of his career more firmly in hand, has determined what appears to be a more organic path for himself, I think those music lovers who seek artists who are genuine and authentic…artists who are of, about and in the moment of their art, will see the beauty of his music. Thanks TOfans for your wonderful words!! The ASCAP interview really put things into perspective about what David has been through these past 3 years. What a rat race & I’m glad he is getting sometime to “breathe”!! This interview was probably one of the best that I have ever heard from David. Love that he has stayed so grounded & down to earth since the AI ordeal! kizzi, “I think those music lovers who seek artists who are genuine and authentic…artists who are of, about and in the moment of their art, will see the beauty of his music”. ..
“Witness beauty if you dare”…I love a good dare. I don’t think I’d seize on a single word in a very positive review and call it “hate”. A “robotic” ability to sing on key is hardly a horrible thing. It’s just an attempt by the writer to be clever. I love David’s ASCAP interview too, and having just read his book, I’m blown away by how inspiring he can be. But I also adore the music from some of our more outrageous artists. I can’t stop listening to “Born this Way” and “Firework” lately, and I like how those artists are so multi-faceted. I just read your write up …and you so right in all your comments. Every time I get frustrated by comments, polls, or the music industry when it concerns David – all it takes is listening to David’s music or reading his tweets, or it’s interesting how many of those days David will send out a vlog and this always puts a smile on my face gives me the motivation to “put one step in front of the other”…and just makes me an even better and bigger fan. We all know this is for the long run…we will always be here for David! “Beauty is in the eye of the beholder. To the haters I say: “Witness beauty if you dare.””<<< yes!!! Still voting tonight though….. just can not help myself…..lol! Have only seen the first 3 minutes of this interview so far but I’ve heard so much about it I will make sure to watch the rest tomorrow. Hello to TOfan…I enjoyed reading your article as always and Vancouver won tonight, haha. Gotta get the hockey in. So if you look at life (can you imagine anyone saying that?) you will see this. 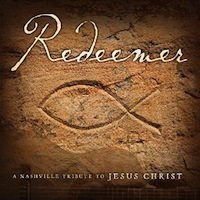 There is the fabulous artistry of David, the mountains of wonderful songs and memories. But in this life there is also the usual negativity, the put downs, the things unsettled. None of the negativity matters diddly squat in the scheme of David and his music. He gives his music to us and we take it with a thank-you David. Maybe us worriers should make it simple and worry not, complain not. At least give it a try and leave all of the rest to David. If we concentrated on playing his songs and videos in the forefront, we would be celebrating him and promoting his music. But then that would be in a more perfect world and we just seem to have trouble with that. And for the voting? It keeps one busy I guess like a crossword puzzle when there is nothing else to do but challenge the mind. Yep, getting antsy for May 28th. Amazing thoughts, Tofan. I just totally, 100% agree. The comments here tonight have also mirrored how I feel. David is top man in my book, and there he will stay–polls or no polls. He is pure talent and artist. Robotic? Puh-leze! Some great comments here everyone, if they had an award for best fans of an artist, I have a feeling David would be voting lots for his fans, lol. Well, polls, shmolls as someone said. We only lost this radio poll by 1 pct. Have to give kudos to David’s loving fans, they work hard! This tweet from “Davidsbackpack” made me laugh. I’m sure “Davidsbackpack” is one of David’s relatives (or not) but love some of the cute tweets. Thanks for sharing that tweet, it made me laugh. Plus, it offers some insightful perspective. Those comments from EW are irritating, but I bet they feel pretty irritated themselves for having to include David in that article. So, we actually get the last laugh–no matter how much they’d like to dismiss him, they can’t–he’s just too dang amazing. Congrats, JR & all Pinoy fans!!!!! Greeeaaaaat interview with Adele’s producer, HERE! I soooo hope David gets to work with him someday! “I think that the general public is becoming more in tune with real artists and you see the recognition finally of people like the Black Keys and people like Mumford & Sons jumping on the scene, and obviously people like Adele,” he said. Way to get that angst out, TOfan! I have somehow missed the “shooting foam from your D cups” and thank goodness for that! I’m assuming it was Lady GaGa, but didn’t really think she’s a D cup. At any rate, I was an obsessive voter on that stupid poll for reasons I truly can’t explain since I long ago gave up the “Mr. Twitter World, Mr. Twitter Universe”, Mr. Twitter USA, Mr. Twitter how many hits can you get for my site” polls long ago. It’s so very nice to be back to “normal” and reading the fansites, looking at comments (sometimes that makes me angry tho), listening/watching videos such as the lovely interview from David shown above, but I think the thing that really got to me during the last hours of that stupid poll, was the tweet from David about Ginger tea and a tweet from Sunny showing a lovely nature scene as though they were trying to remind us to “chill” and know that David is fine and all is right with the world when we take time to “Look Around” and smell the roses instead of Stomping them. I love that David has that ability to grab our attention and snap us back to a reality of loving those things that are really important to us. Going to go listen to “Look Around” now cause it’s one of my favorite songs by David. Y’all have a wonderful day! Jenni, I wanted to post that I agree with you. I did not want you to feel like you were all alone. I certainly have not gotten the impression that Jordin is doing something that she doesn’t want to be doing. She really seems to love her new single and was very excited about doing choreography. I also haven’t seen her doing something that isn’t her. Kris, I sincerely hope you & Jenni are right, love Jordin, she’s so talented and has such a bright future! How I love this post, and I’d had a similar thought over the past few days, as I saw my great fan friends slaving over the polls and I couldn’t help much because of real life celebrations and obligations, and again as a photo popped up to cause more worry over David’s management choices. Whenever we worry, we really should just look at whatever video David has uploaded most recently, because he doesn’t seem to be sweating any of this. He looks happier lately than I’ve seen him for a while, or else an actor on the level of Meryl Streep. Either way, he’s ahead, right? Wanted to add that I also cancelled my EW subscription at about the time that certain EW bloggers got nasty. I have yet to buy a single copy since, and I noticed that their magazine began looking like a rag at about that time too — a definite reduction in production quality. Why they continue to spew lies and hatred is a mystery to me. I won’t knowingly give them or their bloggers and hit or a dime, but other than that, I don’t really care anymore. I have always been struck by his recurring comment over the past 3 years that he thought AI would be a learning experience. That he’d see how far he would go never anticipating a 2nd place finish, that he would have years to find his sound, develop his skills on musical instruments. That finish put him in the fast forward motion from the finale of AI to a couple of months ago. Oh yeah, Working Backwards, describes my fan journey too. I was a fan, fanatically so, uncharacteristically a solid, dead center, locked in, fully loaded fan. And I have had to “work backwards” to find the who, what, when, where and why of it. P.S. Thanks for the NA info TOfan. Seems to be his signature performance at present. Not a bad thing to be known for…not bad at’all. so true, kizzi, David did seem more mature and relaxed in that interview (and the other ASCAP one where he spoke of wanting to eventually write songs for other artists). It was great to see him feeling “at home” in a songwriter’s environment and what great insight he has to see that he’s “working backwards” and that there’s no “fast-forward” or skipping steps when it comes to becoming the authentic, relevant artist he wants to be. Hoping along with you for vids TOfan >>> and you are right Kizzi, the NA is def not a bad thing to be known for…. every time he has the opportunity to sing it I think he gains respect and new fans for the sheer quality of his performance. Good things are in store for him and us, we just need to relax and watch (and listen) to it all unfold. I am in a happy place as far as David is concerned, and glad to be in this little corner of the archuverse with you all, and also relieved that that dang poll is over. Was stuck in a series of meeting the whole day, hence the delayed upload. Thanks, JR!!!!! Posted in new post/thread!!! !